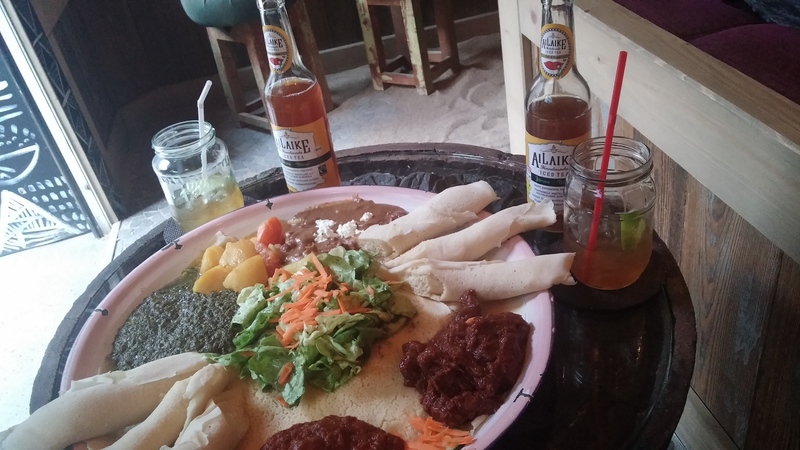 Although both my sister and I cook fairly well, my favourite meal in Frankfurt was definitely in the restaurant ‘In the Heart of Africa’ (Im Herzen Afrikas). We went on a recommendation of a friend, who praised the shared platter, the gigantic portions, and the unique décor and feel of the place. It was definitely a wonderful experience. Full disclaimer: As you can only pay in cash in this establishment (and we forgot this until paying), we left a miserable tip, and I therefore want to make good some of this error. Located a stone’s throw away from the main rail station, the restaurant is easy to spot from the road. You just have to look for the benches under the exotic looking sun shades, reminding me of a beach resort. When you enter the restaurant (assuming you choose to eat inside), you will find many low seats on a ground of sand, and dark walls with a geometric pattern highlighted on them. There is also a sink, as you will be eating with your hands, and a bar. The outside of the restaurant when it is closed- Picture shamelessly taken from their Facebook! The menu has many choices, but the sharing platter is definitely the main attraction. You chose from several different dishes to be included from the vegetarian and meat options that are available. The price is calculated by the number of people eating, and you all tuck in, tearing off some flatbread, gathering up some filling, and trying not to gobble it down so greedily that you get a stomach ache. Even bearing in mind the suggestion that we should try and avoid eating too much of the filling bread, the simple shared platter was more than enough for the two of us. Note, we arrived hungry- we had forgotten lunch and walked through Frankfurt all day long. I can only conclude that the portion size makes the decent price (10 Euros per person) very worth it! We walked out with our bellies full and smiles on our faces. For More information the German website is available here (im-herzen-afrikas.de). Although I cannot currently find it, the staff did have English menus and were all fluent in English, so this also should not be a concern for the international traveller! The restaurant is at the time of publishing open every day except for Mondays. Updated information should be obtained from the website or by calling the restaurant in advance.